'Sky and water have always attracted me emotionally', declared Dunlop, adding that, when he moved to the coast shortly after WWII, it was West Sussex which drew him, with its intense, diffuse light pervading and illuminating all that it touched. 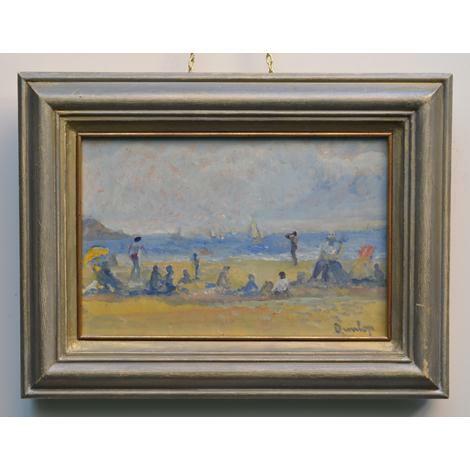 Here, in this little picture, everything is reduced to essentials: bands of sky, sea, sand and figures are melded together by the soft, grey light which Dunlop so admired. The liquid paint, applied with sable brush, and the deliberately limited range of colour, are characteristic of his spare, evocative, post-War work. We believe the frame to be original. It shows some wear, commensurate with the age of the picture.